Milwaukee reader Rob Jensen has sent in details of his daily driver, a just-completed Harley custom. 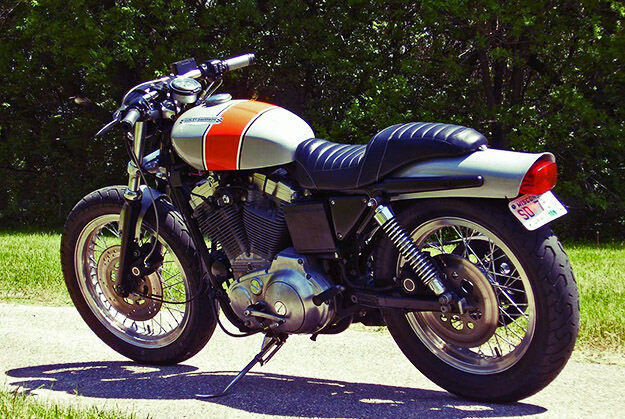 It’s based on a 1990 XLH Sportster, the last of the rigid-mount 4-speeds. The mods include a Sportster touring tank option from the 1960s, and modern disc hub wheels laced to 70s H-D aluminum rims. The rear fender is a 2007 Wide Glide part, chopped and narrowed for the Sportster frame. Rob’s documented the build on a website: maybe H-D top brass should take a look when they’re figuring out what to do with the XR1200.